María Freire received her education at the Círculo de Bellas Artes and the Universidad del Trabajo, both in Montevideo (1938-1943). She was first influenced by African sculpture, which fueled her interest in the formal and plastic possibilities of tribal artistic expressions. Towards the end of the 1940s, she created a series of bronze heads reduced to their geometric structure. 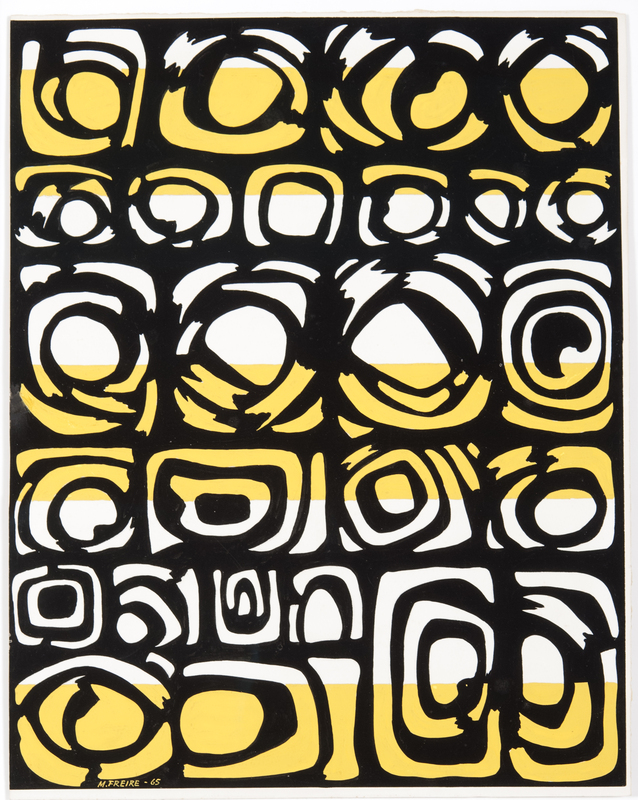 At the beginning of the following decade, she decided to focus exclusively on abstract art. She continued developing her three-dimensional work, producing metallic sculptures of simple, suggestive forms, often extending from the folding of a single bar. In 1952, Freire founded, with her companion José Pedro Costigliolo, the group Arte No Figurativo. It promoted aesthetics similar to those championed by contemporary Argentine and Brazilian groups, but Arte No Figurativo avoided their political posturing and belligerent attitude. For two years Freire participated in the two exhibitions organized by Arte No Figurativo at the Asociación Cristiana de Jóvenes (Montevideo). Flat backgrounds characterized her paintings from the mid-1950s, on which she constructed pictorial spaces with delicate geometric forms and diagonal lines that frequently evoked earlier sculptural works. Freire traveled to Europe with Costigliolo in 1957. They visited museums and met with the main exponents of geometric abstraction. She was particularly impressed by the crafts of the Middle Ages and, in 1958, she made a series of paintings inspired by medieval keys and locks in which the palette, already reduced in previous works, became almost monochromatic. Freire showed these works at the Galerie Les Contemporains (Brussels, 1959). Interestingly, the public interpreted the series of works as symbolic creations with pre-Columbian roots, which is why the artist entitled it, ironically, Sud America. 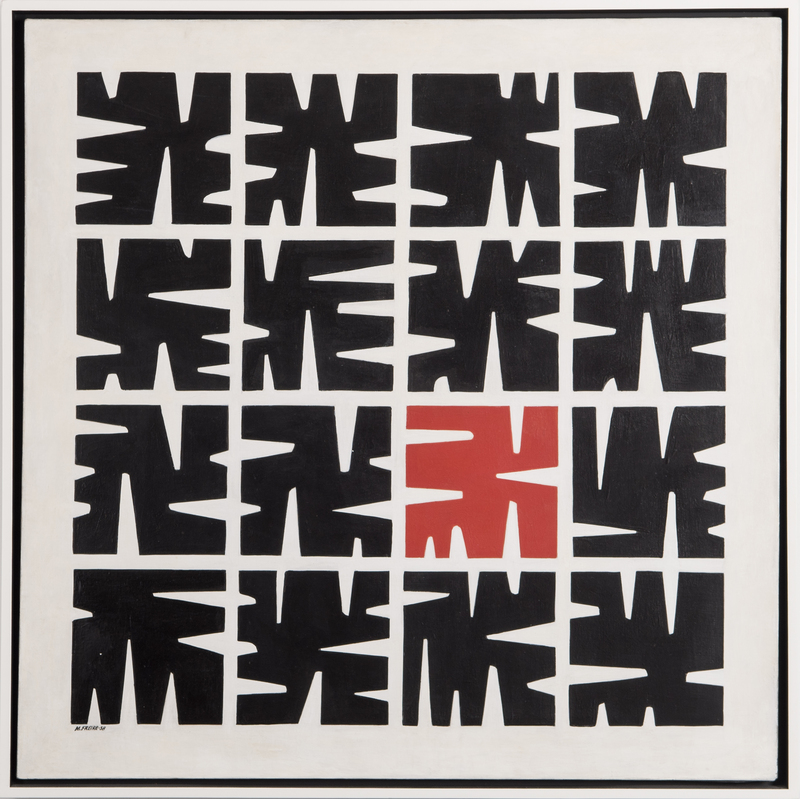 In 1960, she returned to Montevideo, and during the first half of the 1960s, Freire practiced abstract painting. She also returned to sculpture, modeling with mud the forms of the series Sud America. The works of this period had a certain freedom of expression and emotion that was unusual in her other work. In the middle of the decade, Freire returned to painting and produced the series Capricornio and Minotauro. These evolved in a way like sequels to Sud America, but this time the symbolic forms, which, like the previous ones, were organized in bands deprived of any meaning, showed great dynamism on flat backgrounds that were not always monochromatic. This evolution continued in the early 1970s with Córdoba, characterized by Freire’s return to rigidity, and Variantes, a series in which the color became the most important element. This irruption of color replaced the sign as the fundamental element in her work and gave rise to chromatic compositions in sequences of modulation, very much like Op Art. These were the Vibrantes, which kept her busy for the rest of the 1970s, and the Radiantes, which she made in the following decade. Since the end of the 1980s following the death of Costigliolo in 1985, Freire has dedicated herself to recreate works from the series inspired by keys and locks, with titles like América del Sur, El oro de los tigres, and Última serie. In spite of the reference to works from the past, she continued experimenting with color, form, and movement.